Not sure what is Martech or if you even have a Martech Stack. A stack? What in the world is a Martech Stack or Marketing Stack? Don’t fret, this episode is for you. Even if you read that and know EXACTLY what we are talking about we should have some nuggets for you this week as well. So how do you manage the constant change in technology and digital marketing? How to approach selecting a new technology (CRM, Bid Management, Landing Page, etc.) to assist your marketing team. And for those that don’t think they are big enough to need to worry, we HIGHLY encourage you to listen because it is very likely that you use more than you think! If you don’t believe us check out the Stackies link down below and see how other companies think about various technologies and how they relate to their business. Read to Learn How to Win a Free Ticket to Martech Conference! So now that we have you interested in Martech and perhaps the upcoming Martech Conference, here is how you can win a free ticket. Rules: One Entry per person per entry method. Max entries is two. More Rules: Transportation, hotel and everything else will be on you! If you are chosen we will simply put you in contact with one of the organizers that is offering this deal! If you are chosen and later realize you can’t make it please let us know and we will pick someone else (so someone might be able to take advantage of the ticket). There is no other prize or offer in exchange – sorry! 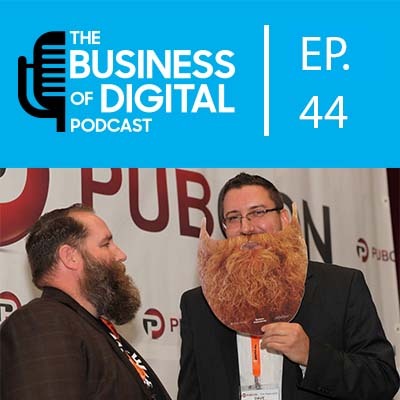 First Way to Enter: Leave a comment below on this page (https://www.businessof.digital/podcast/e44/) with your toughest martech problem. Second Way to Enter: Tweet at our account https://twitter.com/bizofdigital with the hashtag #MarTech and gives us their toughest martech problem. How the winner will be selected: of those that leave comments or tweet at @bizofdigital with the hashtag one winner will randomly be selected. Also if you don’t win have no fear! You can use BOD15 as the discount code for 15% off an All Access pass to attend MarTech.